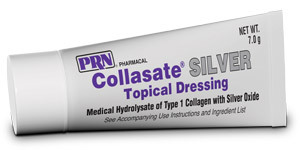 Collasate Silver gel® is the first and only wound healing product for pets that combines collagen and silver oxide for wound healing/first aid needs. Collasate Silver has been demonstrated to produce a reduction of Pseudomonas aeruginosa and Staphylococcus aureus after 24 hours. For topical use in the management of surgical wounds, chronic and acute wounds, traumatic and superficial wounds, first and second degree burns, spays, neutering, de-clawing, foot pad injuries, hot spots, and lick granulomas. The unique, patented molecular configuration of the hydrolyzed collagen in the gel makes it immediately available for the body to begin its own natural healing process – a benefit not offered by native collagen products. Collasate Silver also contains silver oxide, an antimicrobial agent that promotes healing by maintaining a balanced wound environment and fights infection by controlling microbes that are absorbed into the easy-to-apply gel. Collasate Silver soothes and deodorizes, and reduces pain and protects the wound from bacterial insult. This multi-faceted wound treatment option reduces pain by occluding nerve endings, reduces the chance of scarring by providing a moist healing environment, and conforms to any wound site. Collasate Silver is for use on many types of animals, including mammals, birds and reptiles. Download the product detailer for a comprehensive list of product benefits.